Mumbai: India took its first step towards creating a large bank with the country’s largest lender State Bank of India (SBI) and its five associate banks initiating a merger process. All six are state-owned. A merger would create a banking behemoth with a balance sheet size of ₹ 37 trillion, SBI chairman Arundhati Bhattacharya said. That would be more than five times the ₹ 7.2 trillion balance sheet size of India’s second largest lender, ICICI Bank Ltd. The combined entity, however, would still be quite small by global standards. 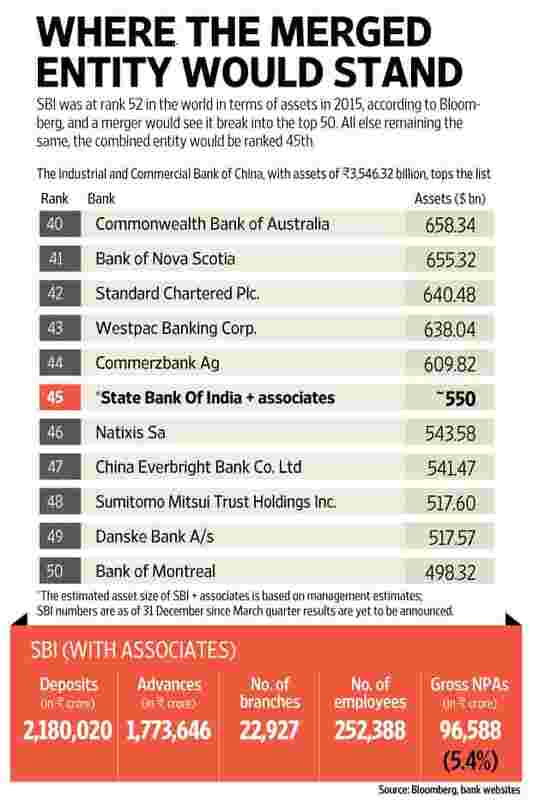 SBI was at rank 52 in the world in terms of assets in 2015, according to Bloomberg, and a merger will see it break into the top 50. All else remaining the same, the combined entity would be ranked 45th. India has flirted with the idea of bank consolidation for years. Several state-owned lenders are much too small to be viable in any significant way, and some experts believe that larger banks can serve the banking needs of the country’s retail and commercial borrowers better. On Tuesday, boards of SBI and the associate banks met individually in Mumbai and decided to begin merger talks with the parent. “State Bank of India has informed BSE that SBI is seeking “in principle sanction" of the Central Government to enter into negotiation with the subsidiary banks (State Bank of Bikaner and Jaipur, State Bank of Hyderabad, State Bank of Mysore, State Bank of Patiala and State Bank of Travancore) and Bharatiya Mahila Bank Limited to acquire their businesses including assets and liabilities," SBI said in a statement to stock exchanges. Similar statements were issued by the three listed associate banks—State Bank of Mysore, State Bank of Travancore and State Bank of Bikaner and Jaipur. The effort is “purely exploratory" at this stage and there is no certainty that the process will result in an eventual merger, SBI added in its statement. Efforts at bank consolidation, to create large lenders with the size and scale to fulfil the funding needs of a growing economy, have failed to make headway in the past because of resistance by unions fearful of job losses. Taking note of Tuesday’s development, the All India Bank Employees Association (AIBEA) called for an all-India strike on 20 May to oppose the intended consolidation. The consolidation process is being driven by the government, which is keen to reform the banking sector that’s now weighed down by bad loans. In an interview to Business Standard on Monday, finance minister Arun Jaitley hinted that the government was looking at bank consolidation with some urgency. When asked what the government’s timeline was, Jaitley responded: “Wait for a few days". SBI had seven associates, of which it merged two—State Bank of Saurashtra and State Bank of Indore—with itself over the last 10 years. The five remaining associate banks have a cumulative advances base of ₹ 3.78 trillion and a deposit base of ₹ 5.03 trillion, according to their last reported numbers. SBI, the parent bank, had advances of ₹ 13.91 trillion and deposits of ₹ 16.71 trillion as of the end of the December quarter. “There are a lot of synergies between the banks. Currently there is a lot of duplication," Bhattacharya said. “For instance, each bank runs its own individual treasury. Once you start rationalizing all this, the bank will get a lot of cost benefits. “We will now start talking to all constituents including the employees. Can’t give a timeline but would like to do it as soon as possible," she added. A. Krishna Kumar, a former managing director of SBI, said the merger of associates should probably have happened a long time ago. “But it should be understood that the process will take time. It should not be rushed through. You have to think it through carefully and implement it well," said Kumar, adding that overlaps between these banks will have to be dealt with patiently. “There will definitely be an overlap in terms of branches and employees. Each of these associates was working independently and, particularly in the large cities, were competing with the parent bank. You will have to rationalize these branches over time while ensuring that employees are redeployed appropriately." Bank consolidation was proposed by the government in March at a congregation of bankers and government officials where various issues pertaining to banks were discussed. Jaitley had said that all bankers supported the idea of consolidation among public sector banks and that the country needed a handful of large banks instead of a large number of small banks. What has strengthened the case for such mergers at this stage is the need to infuse capital in state-owned banks that are burdened by a large pile of non-performing assets—the result of an economic downturn that made it difficult for many over-extended corporate borrowers to repay debt. “Consolidation is no longer a luxury for the banking system, it is a need. Earlier, the argument was capital efficiency, saying that the government would have had to shell out more for multiple banks from the same group, hence consolidation would help. But today, NPA (non-performing asset) management and quicker resolution seems to be a bigger reason working in favour of consolidation," said Ashvin Parekh, managing partner of Ashvin Parekh Advisory Services Llp. Publicly traded banks in India added nearly ₹ 1 trillion in bad loans in the quarter ended 31 December, an increase of 29% compared with end-September, as lenders responded to a central bank call to accelerate recognition of stressed assets. This led to a surge in provisions and, consequently, a drop in profits. The government has committed to infusing ₹ 25,000 crore into state-owned banks this year as part of an overall plan to infuse ₹ 70,000 crore over three years. The first tranche of ₹ 25,000 crore was allotted to banks in fiscal 2016. Rating agencies have said the amount of capital needed by these banks will be far in excess of what the government is in a position to provide. India Ratings and Research Pvt. Ltd estimates that banks need a total of ₹ 3.7 trillion between fiscal 2017 and 2019 to meet Basel-III norms.